The book they don’t want you to read! 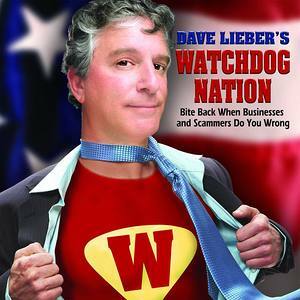 Dave Lieber’s Watchdog Nation shares tips, tools and strategies to bite back when businesses and scammers do you wrong. Save hundreds, even thousands of dollars by learning how you can overcome the pickpockets that call themselves the electric company, the phone company, debt collectors, banks, scammers, e-mail spammers, door-to-door salesmen and countless others who want to harm you and your family. This book contains real stories about real people — by the ultimate authority on the subject. Dave Lieber is The Watchdog investigative columnist for The Fort Worth Star-Telegram in Texas. He has helped countless folks stand up for themselves, understand their rights, fight back and win. Consumers will understand how they can take advantage of laws, regulations and other methods that will help them overcome stubborn and uncaring customer service representatives, companies large and small who ignore their complaints and the growing group of hard-core criminals who take advantage of modern technology to hurt you.